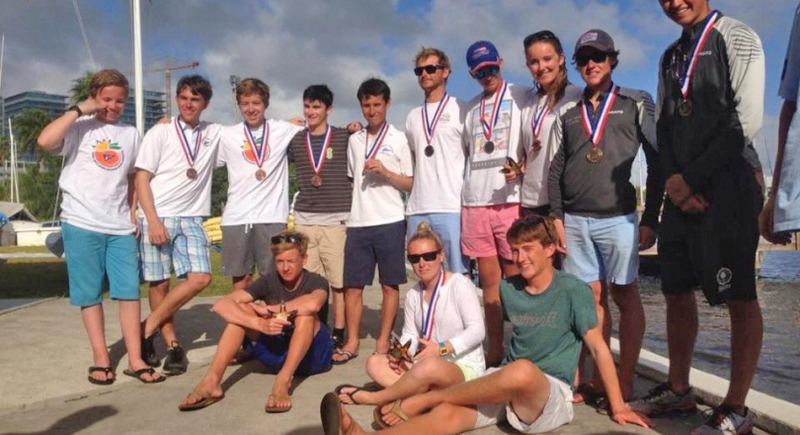 Lakewood Yacht Club’s youth sailing team took first place in laser class at the Orange Bowl Regatta last month when Miami welcomed nearly 700 youth racers for the annual event in Biscayne Bay. Asher Zittrer sailed the 13-foot laser that defeated 25 other teams in 11 races. Held annually in conjunction with the Orange Bowl, the international youth regatta draws world-class sailors ages 8-18 to South Florida for the largest four-day international youth sailing event in the U.S. Attracting nearly 700 racers from all over the world, the event is an excellent opportunity for youth to go on to achieve even greater notoriety in the sailing world. Several of the Orange Bowl competitors sail the race multiple times in multiple classes as their skills improve. This year, the regatta attracted contenders from 27 states and 23 countries worldwide. Opti class, typically for beginner sailors, is a small, one-person dingy, while lasers are better suited for more skilled sailors. The 420 class, meant for advanced sailors, can be crewed by two. Racers like Asher Zittrer gravitate toward the sleek lasers for their speed and maneuverability in competition. Bringing home a medal and a trophy can be exhausting work. Zittrer slept on the plane the whole way home and was greeted by his parents and well-wishers when he returned. The house was decked out in a big banner that said ‘Way to Go, Asher!’ The following days were spent getting ready to go back to school and making plans for next year’s race. Lakewood Yacht Club had two sailors compete in the 25-boat laser class, eight sailors in opti class racing with 225 other competitors, and 4 teams out of 36 competing in the international 420 class. The club recognizes Bryan Trammel for coming in 5th overall in laser class, Zane Rogers for finishing 10th overall in optis, and Wiley Rogers and Jack Parkin for a first-place win in 420 class. Big congrats to the Lakewood Race Team for another great event!